If you're a freelance professional offering different kinds of services, a good online portfolio is a must to convince the prospects for better conversion rate. Although one can custom code a portfolio from scratch, it's not easy to create one if you're technically challenged. That's where specific plugins made for creating portfolios can help you in a big way. If your business or freelance website is powered by WordPress, you can use these powerful portfolio plugins to create a stunning showcase of your work in no time. No matter which plugin you're using, make sure you highlight your best work to get the desired results. I've tested each of the plugins included in the list on a test blog to ensure you get the best ones from the lot. Following my methodology, use a dummy installation to build a copy of your portfolio before transferring the final result on the live website. So, let's get started and try out these flexible and user-friendly portfolio plugins made specifically for self-hosted WordPress websites and business blogs. 1. 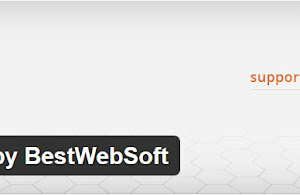 Portfolio by BestWebSoft: This is one of the most flexible portfolio plugins to create an effective showcase of the work. It has ample options to customize the entries within the portfolio to highlight the work in the best possible way. I like its ability to include multiple screenshots for a single portfolio item. Through a shortcode, you can literally display a custom portfolio section on any static page or within a regular blog post entry. The plugin has been translated in over a dozen languages out-of-the-box. When combined with select plugins, creating a portfolio with this plugin is a breeze. Apart from using standard portfolio fields, users can also create custom fields for a richer presentation of items and work samples. Template creation of the base portfolio layout is also dead simple through this plugin. 2. Portfolio Gallery: This excellent portfolio plugin provides 7 different ways to show your work. The entire portfolio is responsive in nature and renders seamlessly on tablets and smartphones. One can add both images and videos within a portfolio page to better present their work samples. Its user-friendly admin panel and the portfolio creation controls enable an average blogger (technically challenged) to create a portfolio within minutes. If required, you can opt either for an image-only or a video-only portfolio layout. One can also combine both to create a custom portfolio page. Apart from inserting a portfolio in posts or pages, a custom location within the design can also be selected. Using its handy sorting and filtering functions allow showcasing select content from the portfolio entries. Powerful filtering support combined with social sharing options gives better visibility to the important entries included in the portfolio. It also has several popup viewing styles to let the potential clients view your work in detail. With plenty of design customization options, one can literally create large numbers of different layout formats to match the site theme. 4. a3 Portfolio: This plugin creates a visually appealing portfolio to showcase the best work for attracting new clients. It displays card based portfolio entries with the support of multiple images for a single entry. The cards itself can be customized to display the information in different formats on mouse hover. The number of portfolio items per row and columns can be customized to get the preferred layout that gels with your existing design. The meta-data associated with each item included in the portfolio can override the global settings to make subtle changes at the micro level. It also supports different types of portfolio widgets to let people easily access the information. The plugin itself uses modern web technologies and lazy loads images for the best viewing experience. 5. Waving Portfolio: Professionals can use this flexible plugin to list their work and skills in a nicely formatted manner. Both light and dark themes are supported for the portfolio ensuring easy integration with almost any design. Grid layout and filtering options allow viewers to easily mine the relevant entries from the database. It has several flexible shortcode attribute definitions to customize the layout and appearance of the portfolio. With ample visual customization options, you are free to modify the portfolio entries both in visual and behavioral terms. If required, clicking on each portfolio item can be disabled too. The portfolio creation interface of this plugin is above excellent and enables quick creation of customized entries to enlist your work in an easy way. 6. GS Portfolio: This is yet another powerful plugin to display responsive portfolio through shortcode. It can be used to display a portfolio with different numbers of columns. Clicking on portfolio entry images makes them pop up for better visibility of your work and samples. It's a no-nonsense plugin which doesn't require any additional setup after installation. Like other good plugins, its shortcode has several attribute definitions for a custom layout of the portfolio. For each portfolio entry, you can assign a featured image too. I also liked its detailed documentation that enables a layman to easily learn the portfolio creation process in a few easy steps. The portfolio created through this plugin renders perfectly in all the modern web browsers. I've used this plugin for one of my clients and the feedback was quite positive. 7. Nimble Portfolio: With lightbox support, this useful plugin is a good choice to showcase rich media samples showcasing your work within a portfolio. It's responsive out-of-the-box with easy controls and options. It also has an integrated support for WooCommerce products which can be included in the portfolio. Apart from displaying previews for images and videos, it can also show previews for PDF documents included in the portfolio. Sorting and filtering options allow viewers to easily look for the best work samples they desire to check about. It is completely widget enabled allowing freelancers to display it almost anywhere within the site layout. The parent portfolio theme and the image thumbnail style can also be customized quite easily for a unique look and feel. 8. Codenovo Portfolio: It is one of the easiest portfolio creation plugins available for WordPress users. The portfolio can be shown in the form of a widget anywhere on the entire site and that too in different ways. It has powerful filtering options for the viewers to let them easily select the relevant samples they want to give a look. If you're creating multiple portfolios on the website, you can easily categorize them and can display conditionally in a widget too. One can also configure the number of columns to be included in a portfolio. I liked its flexible widget options which are ideal for a layman who is quickly looking to insert the completed portfolio at the desired place within the website layout. Did I mention, it also supports featured image for all the custom work entries within the portfolio? 9. Responsive Filterable Portfolio: This grid-based portfolio plugin is ideal for freelancers who want to showcase their projects on a single page. With a lightbox effect, each portfolio entry displays the work sample in the best possible way. You can customize the height and the width of the portfolio along with a custom background color. The preview function enables you to see the finished portfolio before making it live on the website. The speed of the slider included in the portfolio can also be adjusted as per the preferences. Similarly, rich media can be removed through a filter. Its PRO version has several powerful customization features to fine-tune the appearance of the portfolio. Through a shortcode, you can easily insert the completed portfolio in both posts and static pages. 10. Bootstrap Multi-language Responsive Portfolio: This intuitive portfolio plugin can be used to display your work and skills in your preferred language. The portfolio is fully responsive to flexible filtering support. It also has a sidebar portfolio widget to enable easy access to the work samples. The layout itself can be customized by limiting the number of columns and maximum entries per page to be shown within the portfolio. Sorting of portfolio entries can be done on a field basis and both in ascending and descending order. The plugin also integrates social sharing options on the portfolio page so that viewers can share it easily. A single portfolio can be displayed in different ways through shortcode parameters to lessen your burden of making multiple portfolios. 11. OTW Portfolio Light: This responsive and user-friendly portfolio making plugin includes 3 different column layouts for showcasing your work samples. Its multi-page portfolio also includes pagination control to quickly browse through all the entries. Similarly, the category based portfolio can also be made without any problem. Freelancers can also include client testimonial with each portfolio entry to gain credibility of their work. Users can either display all the portfolio entries on a single page or can opt for a paginated mode to divide large numbers of entries in multiple pages. Both options can be easily implemented through a handy shortcode. Through global portfolio settings, you can change the image size as well as the width of the portfolio section to match with your layout. 12. Easy Portfolio: This interesting plugin creates an interactive portfolio which is fully responsive and can be filtered based on categories. It has several shortcode parameters to quickly customize the portfolio display. It also has options for customizing the portfolio details page. The entries within the portfolio can be sorted in both ascending and descending order. I liked its portfolio management interface which includes helpful and easy-to-use controls. One can also use a text widget to share the portfolio entries with the visitors. This plugin is ideal for a general blogger who wants a simple way to quickly create a portfolio without going through a complex setup process. Through a shortcode parameter, one can also limit the number of latest work sample entries to be shown within a portfolio grid. 13. Cr3ativ Portfolio: This useful plugin can be used to create portfolio either with filtering support or without such option. The templates can also be chosen to display your work in your preferred format. Similarly, language section can be used to quickly select the relevant files to easily display the portfolio in the preferred language. Users can create custom slugs for category and single portfolio entry pages for better visibility on search engines. It has a good collection of premade templates one can apply to the portfolio to get the best possible layout and design that closely match the existing site design. It also has a single portfolio widget which can be used to add your work samples in places other than regular posts and pages. Power users can also edit the templates CSS file. 14. Arconix Portfolio: It's one of the most flexible and feature-packed portfolio plugins included in this list. With various filtering options, it displays the work samples in a nicely formatted layout which is completely responsive. While filtering the entries, its jQuery-powered animation refreshes the portfolio in a visually appealing manner. Technically sound users can easily use custom CSS code to fine-tune the layout and appearance of the portfolio. Additional plugins offered by the same plugin developer can add new features like a slider and testimonial support to give a boost to the existing portfolio entries. Through shortcode parameters, quick customization of portfolio items is also possible. You can link to pages, media files, audio, and video while including portfolio entries. 15. Custom Content Portfolio: As the name suggests, this handy plugin easily handles an unlimited number of portfolio projects with detailed content entries and related rich media galleries. Custom slugs for portfolio pages are included with an array of descriptive fields for each project allowing you to explain the relevant details associated with the work sample. Apart from assigning categories to the portfolios, one can also assign tags to them. It also has support for sticky projects which can be displayed on the index of the portfolio page. This plugin is hosted on GitHub and is open to contributions from hobbyists and developers. Power users can also use hooks and filters to fine-tune the customization options and the behavior of the portfolio. I'd highly recommend this plugin for freelance photographers. 16. Advanced Portfolio Grid: Freelancers can use this plugin to show their work in a responsive grid. Columns for the grid can be adjusted as per the requirements. Category exclusion is also supported by the backend to hide specific portfolios. Clicking on portfolio entries triggers the image popup to get a closer look at the work sample. Similarly, the thumbnail size for each portfolio entry can also be adjusted to suit your preferences. It's thoroughly checked against all modern web browsers to ensure the portfolio renders perfectly without any issues. Its settings control panel enables site owners to easily adjust various global settings for the portfolios. Like other good portfolio plugins, this one also has shortcode support for easy insertion of the same in posts and static pages. 17. TLP Portfolio: I've used this portfolio plugin for few of my clients to showcase grid-based responsive portfolio. It also has a widget-powered portfolio display option which also includes a carousel slider. The grid format and the sorting of portfolio entries can be easily customized through shortcode parameters. It also has a custom CSS option for advanced users to fine-tune the appearance. It is fully translation ready to enable you to showcase your work in your preferred language. The meta-data associated with each portfolio entry is good enough to supply all the vital information required for the same. Its flexible sorting option also supports ordering of portfolio items on the basis of title and date. Portfolio creation controls are also very user-friendly enabling easy management of new and existing portfolios. 18. JDs Portfolio: This responsive portfolio making plugin has different color options with support of filtering and several hovering effects. It supports multi-column layout and also has a fading effect option on mouse hover. It also integrates category navigation enabling visitors to easily access work samples associated with a specific domain. Similarly, image dimensions can also be customized from the control panel to match with your preferences. Redirection support for portfolio links is also included in this plugin. Similarly, recent portfolios can be easily displayed to showcase your latest work to the potential clients. The shortcode insertion for the portfolio is also easy through a popup from the backend. There is no limit on the number of portfolios and entries you can create through this useful plugin. 19. Birds Portfolio: If you want to showcase multiple portfolios related to different skills, use this plugin for the same. It includes nice hovering and animation effects for each of the entry within the portfolio. It has a unique isotope layout which is fully responsive looking nice on tablets and smartphones. This is yet another portfolio plugin which is fully translation ready. Few language translations are already bundled with this plugin. Tons of meta-data is available to be included with every entry within the portfolio. Its management interface is quite good and enables even a layman to easily maintain his portfolio database. Freelance developers can also extend this plugin after grabbing the entire code from the GitHub platform. Its shortcode includes category based portfolio display parameter. 20. WP Creative Portfolio: Once installed, you can easily integrate a new portfolio on a page or post through a shortcode. It has a jQuery-powered color picker which enables users to apply unlimited variations of colors to the portfolio layout. The good thing about this responsive portfolio is that it works perfectly even in older web browsers like IE6 and its successors. Global custom settings can be used to apply select options for each of the portfolio entry. If you're good at mixing colors for the web copy, you must use this plugin to leverage the unlimited color applying option. All the portfolio entries are assigned to a custom post type which can be customized as per the needs. It doesn't require any additional setup after installation and one can get started immediately after its activation. 21. Portfolio Gallery Master: As the name implies, each portfolio entry created through this plugin is stored as a gallery and is displayed in the form of a responsive grid on the page. Custom settings for overlay effects, frames, and background colors are accessible from the dashboard. The number of galleries to be shown on a single row can also be customized. Links for all the portfolio entries can also be deactivated along with mouse hover effects if required. Featured images can also be assigned to the work samples along with regular screenshots. Portfolio-related gallery management is quite simple and user-friendly with this plugin. It uses a popular jQuery-based library for hover effects. It's ideal for those freelancers who're looking to include loads of rich media files with each portfolio entry. 22. Sherky Simple Portfolio: This plugin creates one of the most beautiful layouts for the portfolio. It's powered by jQuery and leverages the power of this library to its fullest. Shortcode assisted portfolio insertion is quite easy for novices too. While creating the personal profile section within the portfolio, one can also add social links for popular platforms. Similar sections are also available for displaying skill set and objectives of the freelancer. The grid-based work sample layout looks good both on light and dark themes. Make sure you complete the personal profile section before displaying portfolios. There are no complex steps involved and the management of a portfolio is dead simple. Professionals must give this plugin a try to see how easy it is to make a stunning portfolio through this plugin. 23. Filterable Portfolio: As the name suggests, this plugin provide helpful filtering options for the viewers to view the right work samples. It also has a template and theme library which can be changed quite easily. Similarly, fancy photo lightbox effects make the interaction pleasant for the viewers. Buttons for external page URLs are also included to redirect users to the full page demos. Flexible shortcode parameters can be used to customize the portfolio's look and feel. Similarly, thumbnail frames and hover effects can also be customized through shortcode parameters. It also has social sharing options integrated into the portfolio to let viewers easily share it with their contacts and network. I liked the available themes bundled with this plugin which look nice on almost all the common designs and layouts. 24. EVM Portfolio: To get a nice and visually appealing portfolio that can be easily filtered, use this plugin on your blog. Categorization of individual portfolio items is also possible to power the filtering options. Color changes for the active theme can also be made directly from the dashboard. The good thing about this portfolio plugin is that a single work sample can be assigned to multiple categories making it quite flexible to use the same data in different portfolios. Power users can also use custom PHP page templates for the portfolio which are safe from subsequent plugin updates. The management interface is easy and obvious. The filtering navigation menu for a portfolio is quite nice and works perfectly on mobile devices too. You can share the sample work with multiple portfolios that lessens your burden by many folds. 25. Responsive Portfolio Gallery: This power-packed portfolio plugin can be used to create large portfolios with masonry effect and integrated lightbox preview option. There's no limit on the number of images one can include in a single portfolio. The rendered portfolio is responsive and looks nice on mobile devices and tablets. It also has customizable hover effects. Different layout options are also available for the freelancers out-of-the-box. Upon clicking, animated zoom action for the image makes it quite interactive which grabs the attention of the viewer. This is yet another portfolio plugin which is fully translation ready. It has multiple shortcodes to insert the final portfolio almost anywhere within the website. The backend settings panel enables easy application of various portfolio settings. 26. Web Portfolio: You can create rich and interactive portfolios through this plugin with multiple color options. Apart from images, one can also include videos within portfolio entries. Filtering support for viewers is also included for better visibility of all your work. A custom font can also be selected for the portfolio to match the base theme. Display of skill set is also prominent while displaying the portfolio entries on the page. It has a user-friendly management interface with easy drop-down options for choosing custom colors for the boxes. Single portfolio page displaying each entry in detail includes a link to live preview of the website or sample work. The masonry layout displays tightly packed thumbnails to accommodate the available space in the parent container. 27. WP Design Portfolio: This plugin is best suited for both graphics and web designers. It can create both a custom portfolio as well as a custom image gallery. Parameters for the shortcode lets you further fine-tune the appearance of the rendered portfolio section. It's search engine friendly with enough meta-data to easily get a good presence in the search results. Its category-based filtering mechanism allows viewers to exclude irrelevant entries from the portfolio. One can also filter out category slugs if needed. Portfolios can be inserted in regular blog posts as well as in custom static landing pages of your choice. The post-creation management of portfolios is also very simple through point and click controls. Custom portfolios created through this plugin renders perfectly on all modern and commonly used web browsers. 28. Behance Portfolio Manager: If much of your sample work and media files are hosted on Behance, you can use this intuitive plugin to easily pull in the relevant data which can be used to power your portfolio. The portfolio can be displayed in both mosaic and grid formats with ample customization options. Filtering support is one of the key features of this portfolio plugin. Tabs for both the layouts can also be customized through the dashboard. It also has a responsive project view which displays the complete details relevant to a single work in depth. Custom styling for the project view is also available to make it more eye-catching. Through pretty URL feature, the plugin automatically follows the default permalink settings of the WordPress. Captions of portfolio entries can also be customized. 29. LCB Portfolio: This is a simple and easy-to-use portfolio plugin to display your work in different ways. Sample screenshots and description can be added to each portfolio entry through a friendly interface. Users can customize the number of columns to be used while displaying the portfolio. It also supports Polish language out-of-the-box. For each portfolio entry, you can write an excerpt and can directly link to the demo page. I found that the 3 or 4 columns portfolio layout works best on both wide-screen desktops and high-end mobile devices. In case, you have a narrow width site design, go for a 1 or 2 column portfolio grid. After activation, you can straightaway start creating portfolio entries and can quickly publish through a standard shortcode. 30. Portfolio Showcase: This handy portfolio plugin has a powerful modal-preview option which is ideal for displaying work images in a nicely formatted manner. This translation ready portfolio plugin also has parameter supported shortcodes for displaying selective information. Category assignment ensures one can easily filter the entries from within the portfolio. It's very lightweight and works like a charm with almost every theme. If you're showcasing vertically long screenshots of your work, this plugin arranges them nicely in the portfolio grid. Editing the attached media is also very easy in case you want to replace the older images with the new screenshots. A custom post type is used for storing and editing portfolio entries which can be filtered easily on the front end. 31. Portfolio Manager Lite: This is one of the few portfolio plugins included in this list which supports several display options for showcasing the work. I liked its newspaper style portfolio section which is ideal for freelancers and professionals. It also has a multi-column carousel which can be used to showcase rich media within portfolio entries. Through a drag and drop interface, you can easily arrange portfolio items ordering them in your preferred way. Single entry portfolio pages can also be customized in terms of layout. Users can select images, audio files, videos, or a slider for showcasing sample work. You can showcase your work in posts, pages, template files as well as in the sidebar. Power users can use custom CSS classes to further configure the visual appearance of the portfolio.